Usually, at the start of the New Year, I have a really strong urge to declutter and organize my home. But this year, it’s different. This year, it isn’t my clutter that’s nagging at me. It’s my to-do list. The trouble is that this time of year, it’s already dark when I get home from work. This, my friends, doesn’t inspire me to take action! Instead, I want to become a skilled practitioner of Hygee and enjoy the finer things winter has to offer, like snuggling up on the couch by the fire with a hot drink in hand. But I know I’ll feel better – today, tomorrow, and even a month from now – if I find a way to be more productive and get more done. How about you? This spring, when the sun is out again in the early evening, wouldn’t it feel amazing if we could spend our time relaxing outside or enjoying a leisurely dinner on the deck instead of stressing about the tasks that have been weighing us down since January? If so, join me for the Check-It-Off Challenge. All that’s involved is creating a list of 30 tasks that have been hanging out on your to-do list for a little too long and committing to getting them done in the next 30 days. 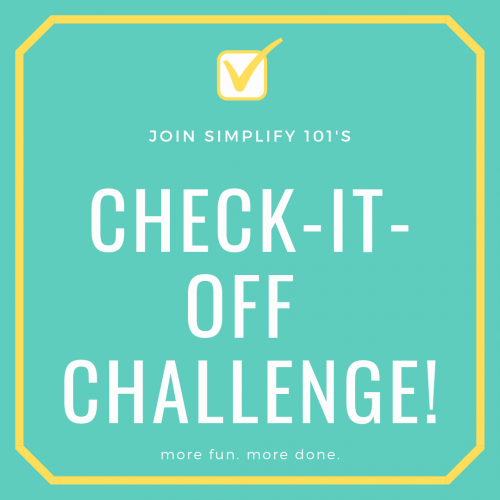 Here’s How to Get More Done with the Check-It-Off Challenge! Step 1: Create a list of 30 tasks. If you aren’t currently using a to-do list, now’s the time to start. Do a quick brain dump of all the tasks and projects that are vying for your attention. If it’s been a while since you’ve captured your to-dos in writing, this won’t be fun. (Sorry, no sugar coating here.) But it will be worth it! Keep taking deep breaths as you fill up your paper with things you intend to do and remind yourself that it doesn’t all have to get done now. You have plenty of time to get this stuff done, and now a plan to do it! Once your big to-do list is written down, select 30 tasks for the challenge and write them down on a piece of paper using the tips below. Also, jot down today’s date and 30 days from today. This is your deadline! The idea behind the challenge is to create momentum and get more done than you would have sans the challenge. Based on this, try to create a list of tasks for the challenge with the following criteria in mind. Tasks that have been hanging out on your to-do list for longer than you care to admit. Some of mine include getting glasses, itemizing donations from a really big Goodwill run (last summer! ), and organizing my passwords. You want your list to include things that you need an extra nudge to do, not something that you would do anyway. Tasks that move you toward a new goal. For example, if you set a goal to declutter your home, it’s completely fair if you have tasks such as “declutter kitchen counter” and “organize bedroom closet” on your task list. Or, if you set a goal to eat healthier this year and want to start meal planning, that’s a great candidate too. Doing laundry, however, isn’t fair game, unless you’re really far behind and have been avoiding a mega-catch-up-on-laundry session. That’s the kind of stuff we want to put on the list. Break multi-step projects into smaller tasks. Make sure your list isn’t all a bunch of huge multi-step projects. Give yourself some simpler tasks that you can get done in a single session. For example, a project like organizing passwords could include the following tasks: research password apps, update passwords, and then finally enter them. This tip is the most important! Often the tasks we avoid on our to-do list aren’t tasks at all, they’re projects without a defined first step. Write down the steps instead of the projects and see how this motivates you to get started. Step 2: Get busy checking stuff off! Your goal is to put a checkmark next to all 30 things on your list in the next 30 days. First off, post a comment to let everyone know you’re in. Accountability is your friend, my friend. Then, come back here and post your progress reports, comment on the Check-It-Off Challenge post on Facebook, or even post on Instagram with the hashtag #checkitoffchallenge. I can’t wait to see what you accomplish in the next 30 days! I’m in! Thanks, Aby. I appreciate that you are offering this way to make myself publicly accountable. I have some long-dreaded tasks that are important, but since they don’t have firm deadlines, I’ve put them off far too long. Time to attack them! Also some items that are not as critical, but that still nag at me every day. For instance, spackling & touching up the many holes in my walls left behind by my house’s former owners. We’ve been here since April! Time to cross this item off my list! Yay, Nancy! Glad you’re joining the challenge! Can’t wait to hear about your progress!! p.s. Always great to hear from you. Yay! So happy you are joining Alissa! I’m going to commit to 10 mins a day, due to my current circumstances. At first I thought your challenge sounded too much to handle right now, but on further reflection: 10 mins x 30 = 300 mins, = 5 hours towards those pesky tasks that might not otherwise happen in the next 30 days. So once again I am grateful to you for your catalysing some good work overhere! This is my minimum daily commitment, and I may do more if it’s right, day by day. Awesome, Jaihn! I’m so glad you’re taking the challenge! Love how you did the math and turned this into a challenge that works for you! Keep us posted on your progress! Yay, Krista! So glad you’re joining in! Keep us posted on your progress! I’ve been thinking about it. I don’t have a lot of lingering tasks so much as huge giant projects that feel impossible to even know where to start breaking them down into smaller steps. But I’m in. Because even something is better than nothing. I’ve come up with 5 tasks for my list initially. I could use Jaihn’s time-tracking trick above but I find that I struggle with time-tracking more than specific action items. So I guess we’ll just see how it goes. Hi Sheila! So glad you’re joining us! I wonder, could you pick one of your huge projects and brainstorm a list of tasks you could do to make progress on it? Or even just one task you could do to move it forward? Often when we have those big projects that feel overwhelming, taking one small step will reveal the next step or steps to take. Let me know if you think that could work. Happy to brainstorm other ideas as well. So far I have tackled two small areas in my bedroom. I uncovered a spot of carpet, and two other horizontal surfaces. In the process (as I expected) I also uncovered several things that need to be dealt with and which have been put onto my to do list. The bedroom feels like a manageable space to tackle a bit at a time. It forces me to take it one small bit at a time because at the end of the day I want to have my bed cleared off again so I can go to sleep! (I use my bed as my sorting/work surface). Finding bite size pieces has always been a struggle especially in the worst rooms of the house. But for now, I think I’ve found a happy medium. I like being in my bedroom (it’s warm and sunny – key features during winter!) and it’s easier to find small chunks of overwhelm to deal with here than in other parts of the house. I’m glad you’ve come back to your online organizing work again. You are always so helpful, positive, and encouraging. Hmmm, are we supposed to post back here? Anyway, so far, so good, although I am counting making my list as one of my tasks. But I also hung a mirror in my entryway (it had just been propped up–much better now) and a lamp over an armchair. I started with tangible, visible-every-day items, but for the coming week, my plan is to deal with some financial “housekeeping”–stuff I truly hate doing, but that needs attention. I’ve broken some of it down into smaller steps, so I hope that will motivate me. Nice work, Nancy! Yes, come back here to check in just like you did! I’ll be posting an update thread, soon, and then you can post there if you prefer! But for now, keeping checking stuff off your list. Nice job breaking down the financial housekeeping. One of my least favorite categories of tasks, too. Good luck!! That’s fantastic! It is always such a pleasant surprise when some of these pesky tasks take less time than imagined! Yay for that and for your progress! Hello Aby! Good to “see” you again. I was just looking at a huge “to do” list I was about to migrate from January to February…….let me see…it has 25 tasks on it. I”ll check in if it’s not too difficult. Hi, Alana! So nice to hear from you. Glad you’re joining the Challenge. Can’t wait to hear how it goes for you. I am in! I will need to do a small commitment like Jaihn! 10 minutes a day works for me and I know I can commit to that. Thank you for creating this Challenge! Awesome, Viv! I love that you’re taking Jaihn’s approach and doing what you know will work for you! Can’t wait to hear how it goes. I’m in. I have so many to do’s and big projects that I’ve been wanting to do for a long time! Yay, Michelle! Happy you’re joining in! I’m in! Just got done with my daughters wedding and let lots go. Big to do list and don’t know where to begin! This is great motivation! Thanks Aby! Oh wow, I bet there are lots of things that got pushed aside in favor of wedding tasks and festivities! What a fun reason to fall behind. Hopefully the digging out will be more manageable with the Challenge! Thanks for joining, Alicia! I love how you think!! Great plan! Let us know how the first 30 go. Looks like I’m about a week behind (hadn’t been checking my e-mail recently. I am in. My to do list is way out of control. Step 1 will be a brain dump to get it all on paper and pick the 30 tasks. I should be able to get that done tomorrow morning, while laundry is in the washer. Then I’ll get started on the next 29 tasks. Glad to have you back on-line Aby, you have been missed. You’re right on time! I set this up so people can join whenever they want! I posted the blog post a bit early and just sent an email about it last night! Thanks for missing me, Lill. It’s great to be back. Yay, Linda! So happy you’re joining in!! Keep us posted on your progress. PS How do I get my picture as my avatar? Really good question – let me ask Jay! Stay tuned. Thank Jay, hopefully I have set a photo of me now! I’m in! I could probably do this every month all year, but let’s start with February. Great plan! Glad you’re joining Catriona! I’m in…it always seems to motivate me when I know you are watching to see what we get done! I have a long list of things to do! I am excited to go home and get started! Thanks for challenging us to do what we really don’t want to do! Haha, it works for me, too! I’m extra motivated when I know I’m sharing with all of you. Super exited you’re joining in, Lynne! Keep us posted. I am going to give this a go. List started. Huzzah! Woot! Glad to have you aboard, Crystal! I’m in. The scariest part is the Brain Dump, I hide all kinds of thing in there!!! Oh yes, it is scary! It can feel really terrifying when you’re doing it but boy the relief when it’s all out on paper. Hope it goes well! Let us know. Thank you for this new opportunity, Aby! Love it. It dovetails so nicely with your recent one-month thing. Just what I need right now. Thanks, Joan! So happy to hear that. Glad you’re in! You’ve been such an inspiration to me over the years, I’m in! So glad you’re back online and thank you for another great motivational starting point. Aw, thank you Shari. Day made right here with those sweet comments. Happy you’re in and I can’t wait to hear what you accomplish! I am in! This is the push in the right direction I have been needing. Thank you! Woohoo – yay Doris! So happy you’re in!! I’m in! I have a list that I keep hiding . I don’t work so I have no excuse (except that I don’t want to do it). While my list does have larger projects, I know that I can come up with smaller tasks – say, spend at least 30 minutes in my daughter’s old room putting things away to make it my sewing space and still have room to throw an inflatable queen bed in there for company! That sounds like a terrific approach Nancy! It’s so important to bite size those big monster tasks into something less scary! Can’t wait to hear what you accompish in the days ahead! I’m in. The making of the list is easy for me, I make them all the time. It’s the doing that’s hard, especially the stuff that doesn’t have a deadline. Or the stuff I don’t really want to do but NEED to do. Or SHOULD do. Self-imposed deadlines don’t work very well. It needs to be other-imposed. Well, here’s to trying to do it differently during the month of February. Girl, I’m right there with you! Those tasks can linger endlessly, but hehe, I set a deadline for you! Keep us posted on your progress! I’m in! list done and project one – step one is getting a place to work on pictures/keepsakes I have thrown in boxes. I’m afraid of the mess when I pull all of this stuff out. I will probably get lost in the memories. Today’s goal is to get a place and start pulling together all my envelopes of pictures. I need to be ready to dive in tomorrow. What an excellent starting point! The right workspace is so important! Can’t wait to hear about your progress. That’s a great project for this challenge. Awesome! Excited to have you along for the challenge! I am sort of in ;-). I am all for accountability but I also know I will be gone for some days this upcoming month. We moved almost 8 weeks ago so there is lots to do still! Yay, Petra! Do what works for you! Glad you’re joining in. I’m in too! I’ve started thinking about my list of 30 things. There are some house decorating tasks that have been hanging around a long time, filing that needs doing, also some fitness and health goals. It’s going to be good!! Woohoo! Welcome to the challenge Pauline! I’m in! I started on February 1st with an initial list of A LOT. I culled and landed on the top 38 nagging items that I’ve been putting off for too long! Nice job, Jean! Keep us posted on your progress! Is your list numbered? Maybe you could draw a number from a hat and do whatever task you draw. I have 36 items on my list – and looking forward to checking them off !! !